What makes you different as a builder? On Time & On Budget Guarantee. Quality is our main goal and delivering on time and on budget results is our mission. 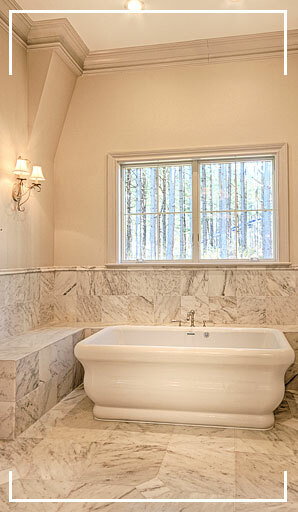 Our own line of custom millwork & Stonework is a perfect example of how we differentiate our homes. When you visit us you will see the difference. Many of our standard features are options with others. We personalize the process and understand that the home we build for our customers is their dream home. We see to it that it is a GREAT EXPERIENCE! Your custom home will be finished on time and on budget because of the award-winning team that will make your project its top priority. What is your on-time record? How long does it take to build? We consistently bring our jobs in on time. This directly translated in to money savings – TIME IS MONEY – less aggravation, and a more satisfying experience for you. Our average time from start to finish is around 6-12 months. Of course, weather dictates a great deal of this timeframe. If we experience a great deal of poor building weather, the process can take a bit longer. Our goal is to always have activity on our custom homes to ensure that we meet or beat our deadlines! How do you set the price on your custom homes? After a careful evaluation of the plans and specifications, we give a firm price. We contract on this price and take the risk out of the “price equation”. Of course, along the way, most customers will make changes. Since our team puts a lot of thought into our home specifications, usually, the customer is extremely pleased at how reasonable the change price is. We find that we have the ability, with proper planning early in the process, to minimize dramatic changes to the original price. We don’t believe in “cost-plus” strategies as it often creates running over budget and conflicts with customers. We offer a complete one-year warranty on the homes we build. Of course, most of our subcontractors offer two-year labor warranties and the appliances we install range from 5 years to lifetime coverage. For an additional cost, we offer a warranty that covers our homes through 10 years! Our goal is to ensure that our lineup of excellent tradesmen are supervised throughout each step of the constructions process. Since we regularly only build 2-5 homes per year, our staff will give your custom home personalized attention from start to finish. As work progresses on your project, your main point of contact will be our Director of Constructions who will be assigned to your project. Utilizing some of the finest computer technology in the marketplace, Apex will keep you informed and up to date on the progress of the project with photos and your own personal website dedicated to your home. For business related issues, you should contact our company’s President, Scott Prendergast. Do you rely on outside professional for financing? Absolutely. We have a several trusted professionals that work with our clients. The homes we build are upper bracket in prices and we only rely on professionals who will get the job done in a competitive manner…without the traditional hassles that people experience with most lenders.